SAN FRANCISCO, Calif. /California Newswire/ — A recent study of 18-24 year old American high school graduates commissioned by education nonprofit World Savvy, with support from the International Baccalaureate Organization, shows a desire among young people to learn more about global topics, but a conspicuous lack of instruction within American schools to satisfy these needs. The resulting lack of global competency skills can make it difficult for young Americans to thrive in an increasingly global economy. "There is no question that the shifting demands of an interconnected, interdependent global economy and society requires that graduates are globally competent; knowledgeable about the world, capable of thinking creatively and critically about problems, and adept at working collaboratively with a diverse group of people to find solutions," remarked Dana Mortenson, Co-Founder and Executive Director of World Savvy, the nonprofit organization responsible for commissioning the study. "It is imperative that we create learning environments that prioritize and cultivate this kind of global experience, if we want students to truly be college and career ready. Through exposure to a range of educational programs which develop global competency, World Savvy students have this kind of preparation." Young Americans see the value in learning globally; there is a high demand among young adults for global competency education. * 80 percent of those surveyed believe that jobs are becoming increasingly international in nature. * 60 percent say they would be better employees if they had a better understanding of different world cultures. * 86 percent agree that a solid foundation in world history and events is crucial in coming up with solutions to the problems in the world today. * Nearly 90 percent believe that developments abroad can have significant implications on the U.S. economy. * 79 percent say that it is important in today's world to be comfortable interacting with people of different cultural backgrounds (on par with the perceived importance of writing skills [78 percent], technical skills [76 percent] and math skills [77 percent]). * While the vast majority respondents see the importance of global literacy, 48 percent actively disagree with the statement that their 6th-12th grade education provided instruction that helps them to understand the roots of global issues that affect their lives today. * 63 percent indicated that they did not discuss world events in their high school classes. * Only a little over half (54 percent) think that their high school teachers incorporated a global perspective into their curriculums. * 78 percent of students do not know that Mandarin is the most commonly spoken language in the world; 45 percent thought it was English. * 77 percent of respondents cannot correctly identify Canada as the U.S.'s largest trading partner. * 72 percent of students surveyed cannot identify which region Afghanistan is located in. * Fewer than half know that Libya is located in northern Africa. * Regularly or often discuss news and world events with other people (+21 percent). * Actively seek out news and information about world events (+17). * Vote in local and national elections (+14 percent). * Received a very well rounded and useful high school education (+13). * Diversity is an asset (+9 percent). * Volunteered to support a cause they believe in (+8 percent). * Are curious about the world around them (+8 percent). * Believe developments abroad can have significant implications on the U.S. economy (+8 percent). * Believe that what happens in the US affects people around the globe (+7 percent). This suggests that exposure to global competency education in high school helps to inspire young adults to stay abreast of world events, be active in their communities, and understand the interconnectivity of global economies. The Global Competency Poll was conducted by Colligan Market Research between June 29th and July 6th via an online survey among 502 respondents. In order to qualify for this study, respondents had to indicate that they were between the ages of 18-24 year olds, had attended high school in the United States, and had graduated from high school or obtained a GED. The survey included quotas to ensure that the demographics of this audience (gender, age distribution, college enrollment, etc.) matched that of U.S. population of 18-24 year olds. 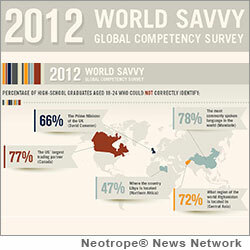 The full scope of study findings can be found at http://worldsavvy.org/about/why-need/world-savvy-global-competency-research-results/ . World Savvy educates and engages youth in community and world affairs, to learn, work and thrive as responsible global citizens in the 21st century. World Savvy has offices in New York, San Francisco and Minneapolis and has reached more than 250,000 students and 2,000 teachers since founding. To learn more, visit http://www.worldsavvy.org/ . Email: dana@worldsavvy.org Cell Phone: 415.271.1388. Founded in 1968 the International Baccalaureate (IB) is a not-for profit foundation, which offers four high quality and challenging educational programmes for a worldwide community of schools. For over 40 years, IB programmes have gained a reputation for their rigour and high academic standards, for preparing students for life in a globalised 21st century, and for helping to develop citizens who will create a better, more peaceful world. Currently there are more than 1 million IB students at nearly 3,500 schools in over 145 countries. To learn more, please visit http://www.ibo.org/ .